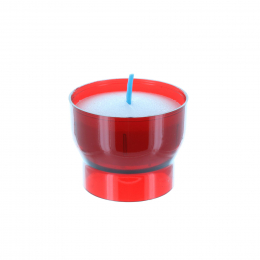 Universal and simple, this batch of two red and multi-purpose votive candle can be set anywhere. Perfect for your prayers, its red transparent flame retardant plastic creates a benevolent light. Get your red votive candle to say your prayers. Batch of 5 plastic glow-in-the-dark rosaries. 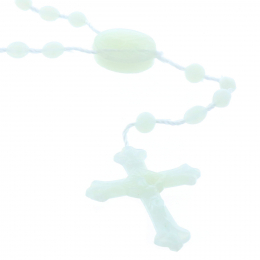 The essential plastic glow-in-the-dark rosary, convenient, discret and cheap. It is mostly worn around the neck and will bring you all the necessary protection for your night prayers. 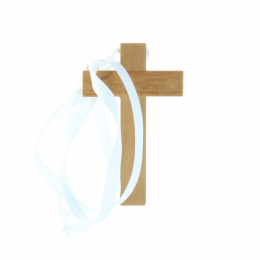 Religious wood communion cross featuring a tether cord and measuring 9.5 cm high. This cross will nicely adorn your alb during religious events like the first communion, the act of faith or the communion. Wear this alb cross around your neck thanks to the cord. Religious cross measuring 13.5 cm high revealing a cute and lovely representation of Our Lady Apparition to Saint Bernadette in Lourdes. The amazing colours and the golden details will beautify your home. This Lourdes religious cross will protect you. 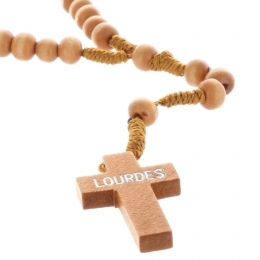 Genuine cord rosary made of wood beads and a wood cross with the word Lourdes. 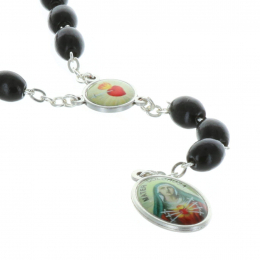 This little rosary is simple, genuine and lovely at the same time. 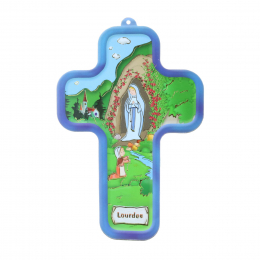 Highly resistant, it will guide your prayers at any time and will make a beautiful Lourdes souvenir. 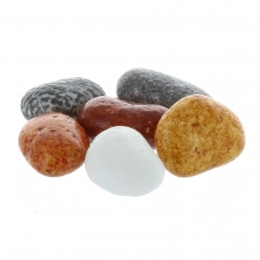 Box with 60g of Gave chocolate pebbles candy, a specialty of Lourdes. 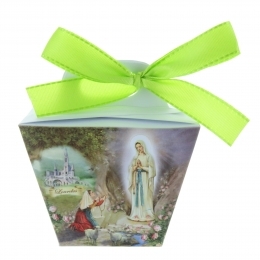 This nice candy box will be perfect to celebrate your christenings, your communions or simply to spend some sweet time for Easter. Would you like any particular ribbon colour? Get in touch with our customer service for more details. Merciful Jesus religious incense made of 20 sticks with a delicate and 100% natural scent. 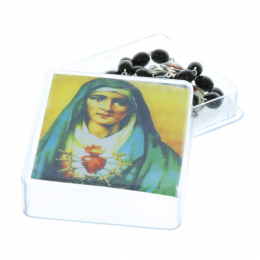 This Merciful Jesus incense will help you trust in Jesus Christ and express your mercy and prayers. The packing box feature a nice prayer. 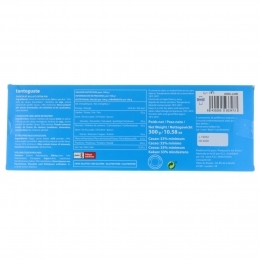 Diffuse this religious incense at home. 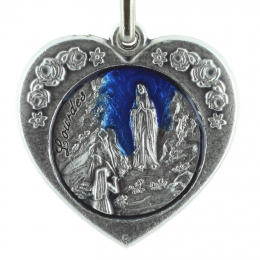 Heart-shaped key-ring decorated with a Lourdes Apparition picture. This heart-shaped key-ring reminds us of Our Lady's love for her son Jesus and the whole mankind. 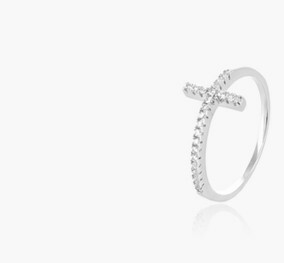 This key-ring will bring you tenderness and comfort. 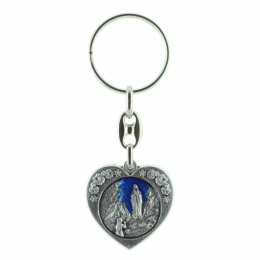 Tie this Lourdes key-ring to your set of rings. Sleeping Saint Joseph statue. 19 cm high colour resin. Like Pope Francis, get the sleeping Saint Joseph statue too and put all your problems under him, because while sleeping, his soul is praying and meditating. Dreams help Joseph receive and understand the act of God. 14 cm high Saint Michael colour resin statue. This statue shows Archangel Michael defeating the demon lying at his feet. The leader of heaven's forces, Saint Michael is one of the three Archangels. Have this Archangel Michael statue shipped at home. Cord rosary made of wood beads, paters and a centerpiece with pictures of Lourdes Apparition and Saint Bernadette. 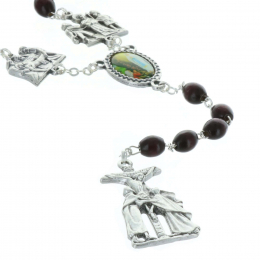 This cord rosary is a devotion item in the most authentic style. 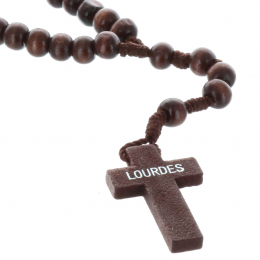 Say your prayers and remember Lourdes thanks to this cord rosary. 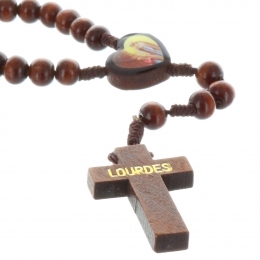 Cord rosary featuring wood beads and a cross with the word Lourdes on one side and the Pax sign on the other side. As an icon of the whole Order of Saint Benedict, the Pax cross is the symbole of Eternal Peace. 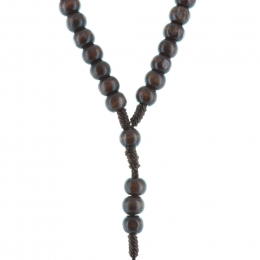 This cord rosary with its wood beads will comfort you while you pray. One-decade rosary made of beautiful hematite beads and a centerpiece representing Our Lady Apparition to Bernadette in Lourdes. 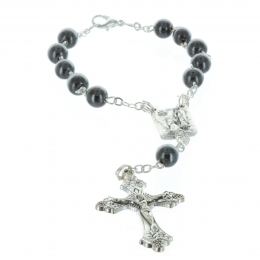 A lovely one-decade rosary that can easily be attached to the wrist thanks to a clasper clip. 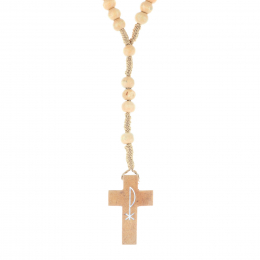 Say your prayers with this nice one-decade rosary. Batch of five 75 ml plastic cans containing precious Lourdes water graciously offered. The team of Palais du Rosaire will fill these 5 cans with Lourdes water at the Grotto of Lourdes. These 5 cans are nicely decorated with a Lourdes Apparition sticker. Have Lourdes water shipped at home. 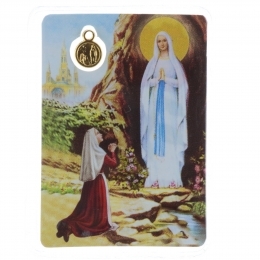 Set of 5 plasticized prayer cards of Our Lady Apparition in front of Bernadette in Lourdes. 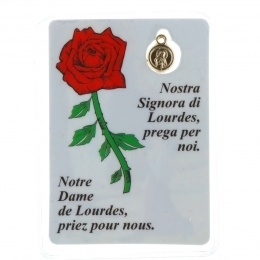 The prayer cards all feature a golden metal medallion showing Lourdes Apparition. Including a chain, this Lourdes golden medallion can be worn every day. 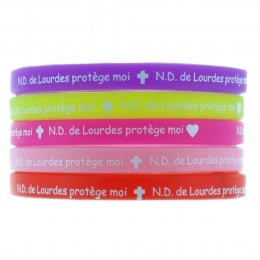 Batch of 5 colour silicon fancy bracelets decorated with the religious phrase "Our Lady of Lourdes, protect me". Five Lourdes silicon fancy bracelets that will please the whole family. 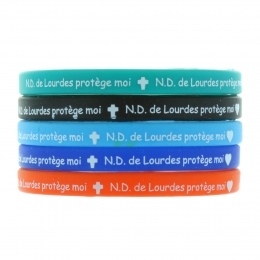 This batch of Lourdes bracelets will make a perefect souvenir and will follow you anywhere. This beautiful wood rosary specially designed to recite the Way of the Cross is perfect to meditate on the hard way that led Christ to his place of pain. 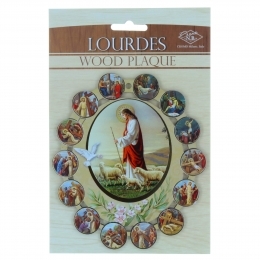 This wood rosary features realistic silvery pictures on each station. 30 cm high wood cross. 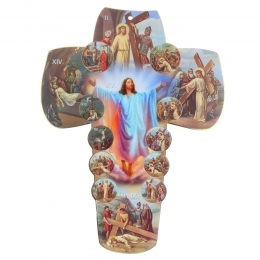 This cross is nicely adorned with the 14 stations of the Way of the Cross, beautiful colours and golden reflects. In the center, the last station, the Resurrection of Christ on Easter Day. With this cross, reflect on his suffering and discover how deep his love for us is. Religious frame size 13x15cm showing the 14 stations of the Way of the Cross. 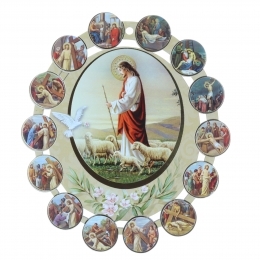 In the centre, this frame is adorned with a picture of Jesus the Good Shepherd, the Holy Spirit and an olive branch. Shepherd of all mankind, Jesus is our guide who sacrificed himself out of love for humanity. 10 cm wood egg certified as manufactured in Russia. 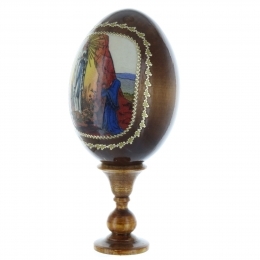 This egg inspired by orthodox art is nicely adorned with a golden-edged Lourdes Apparition. Set on a wood foot, this egg will make an ideal decorative element for your home. 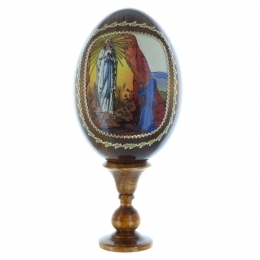 Have this genuine egg shipped at home, it will remind you of the Lourdes Apparitions. This wood rosary portraying Jesus expresses the devotion to the passion of Christ and honors the mystery of his resurrection. 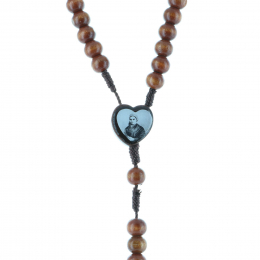 This wood rosary features medallions with the picture of wounds inflicted to Christ by men. 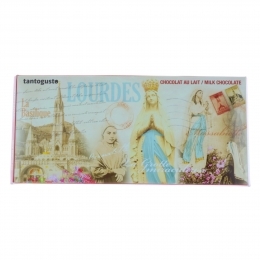 Milk chocolate bar of 100g in a nice packaging showing an old fashioned style view of Lourdes , ' Marian Shrine and the Apparition.A brillant and original idea of souvenir from Lourdes. 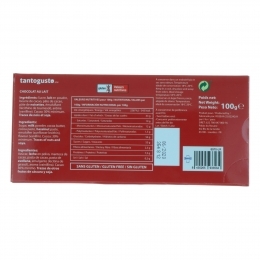 You can receive this tasty gluten free chocolate bar at home and please every chocolate lover, include yourself. 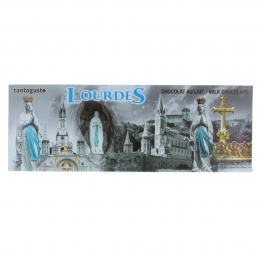 Maxi milk chocolate bar of 300g in a very nice packing showing a black and white view of Lourdes ' Marian Shrine and the famous crowned Our Lady statue.You can receive this sweet and tasty chocolate bar at home and please all chocolate lovers.Perfect for giving or spoilling yourself. Discover the story of Palais du Rosaire, since its establishment in 1914 untill today. The must visit stores in Lourdes for several decades. Palais du Rosaire stores are now available online. 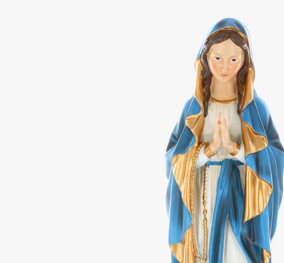 Please visite us and find our online religious items for direct sales to public. The largest choice in Lourdes delivered to your home. *For mainland France, depending on availability.